In 1881 Rocco Caminiti arrived in New South Wales from Italy. At first he lived on the North Coast as a farmer but after getting married to Catarina Gava, he left the North Coast and moved to Sydney. He and Catarina had five sons and two daughters. In the 1903 Census he is stated to be a fisherman. He died in 1907, aged 58. It is presumed that at least a few of his sons were also fishermen. In 1913 Carlo Caminiti, one of Rocco's sons, opened a fish shop in Drummoyne. He was still fishing and some of the fish in his shop were caught by him. In 1923, Carlo purchased the trawler Goonambee from the NSW Government. This was one of the State owned fishing fleet that had been put up for sale. In 1924 he purchased another vessel and in 1926 the Goorangai (lost 20 November 1940 at Port Phillip Heads, Victoria) was acquired. Around this time it appears that Caminiti shortened his name to Cam, at least for the company he set up, Cam and Sons Pty Ltd. 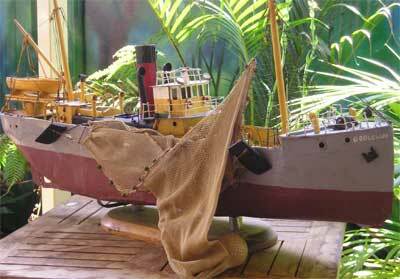 The Olive Cam was built in 1920 as the SS Nodzu by Cook, Welton and Gemmell Ltd of Beverley, England. 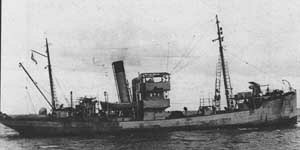 She was 128.5 feet long and 23.5 feet wide and based on the "Castle" class minesweepers built during World War II (see SS Goolgwai for more details). Displacing 281 tons gross, the new vessel was powered by a coal burning triple expansion steam engine with steam from a single boiler. It was capable of being at sea for 10 days at 9.5 knots and was crewed by up to 24 men. The new trawler was delivered to Neale and West Ltd of Cardiff, Wales. At this time her skipper was John Henry 'Jack' Thorne. It appears that the ship may have then been sold to Dalby Steam Fishing Co Ltd of Fleetwood, Lancashire, England as it is mentioned in a web site dedicated to Fleetwood's Fishing Fleet. In 1929 Cam and Sons purchased the Nodzu and started operating her in the waters around Tasmania and off Victoria. She was still called SS Nodzu but sometime later she was renamed Olive Cam. Like most of the Cam fleet, they were named after the children of Mr Caminiti. On Monday 21 October 1929 she arrived in Melbourne with a load of fish from "the deeper coastal waters". She also did this on Tuesday 29 April 1930. On 2 April 1931, one of the new company's trawlers, the Charlie Cam, unsuccessfully attempted to tow the passenger liner, MV Malabar off the rocks at Long Bay in Sydney. In 1932 Caminiti purchased land at 1 Bank Street, Pyrmont and built some buildings. On adjacent land leased from the Sydney Harbour Trust he built wharves. In 1934 Cam and Sons Limited was set up (Graeme Andrews - see references - claims it was Cams and Sons Limited - however, in 1936 it was definitely Cam and Sons Limited as it was involved in a much quoted court case with the Commissioner of Taxation). By this time the fleet included Beryl II, Alfie Cam, Olive Cam, Mary Cam and Goorangai. The Aberfield Coal Mine was purchased (the lease at least) to supply coal for the company's vessels. Coal that was excess to need was sold and another mine was acquired. In 1935 it appears that the Olive Cam was operating, at least at some times, as a minesweeping training vessel. On Wednesday 2 October 1935 a De Havilland DH86 aircraft Loina operated by Holyman Airways Limited was on a flight from Melbourne to Launceston in Tasmania when it crashed off Flinders Island just prior to landing on the island. The Olive Cam was sent to the area to assist in the search for the remains of the aircraft. In 1939 Carlos travelled to Europe to buy ships and fish canning equipment. 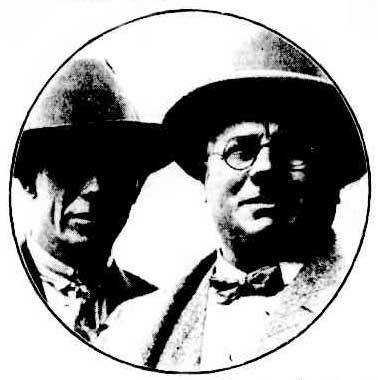 Returning to Australia, Carlos appointed son-in-law John Reid as General Manager, accepting that the purchases he had made might not actually reach Australia due to the imminent war. Over the period from the late 1920s till the 1950s, Cam and Sons operated a total of 16 trawlers off the New South Wales Coast. During 1937-39 the Olive Cam did 2,547 operations (no idea what an operation is) and caught 816,626 kg of fish. 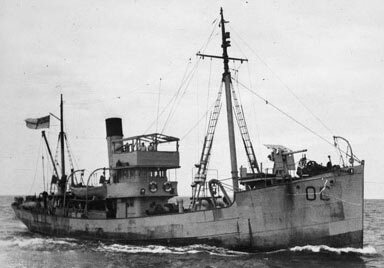 During World War II many of the company's trawlers were requisitioned for service as auxiliary minesweepers. In fact, of Australia's 35 requisitioned auxiliary minesweepers, eight came from the Cam and Sons fleet. These included Mary Cam, Patricia Cam, Alfie Cam and Olive Cam. 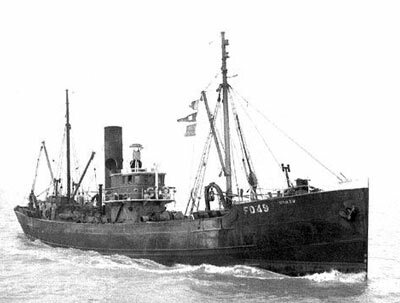 Of the 12 trawlers requisitioned, 11 were of the "Castle" class or variants. During the latter half of 1935, the Olive Cam was chartered by the Royal Australian Navy (RAN) for use in minesweeping trials. On 31 December 1938 Roger "Rod" Torrington joined the ship as radio operator, having recently graduated from the Marconi School and gaining his AWA Technician's exam. He sailed out Sydney Heads, his first trip outside the Harbour. Rod reported that the Olive Cam had a mess room which had all the crew's bunks around it. The lights were on all the time and it was very hard to sleep. He only did the one 12 day trip as when he returned, he gained a job on Tanda. He introduced a friend, Ray Moyes, to Cams to take his place. 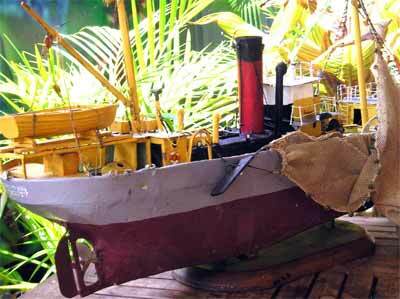 On 18 September 1939, the Olive Cam was requisitioned by the Defence Department for use as an auxiliary minesweeper. 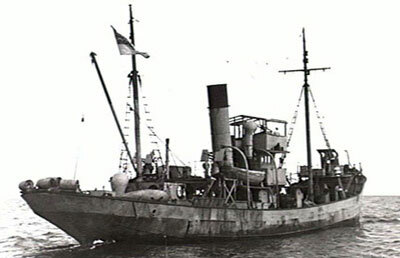 She sailed to Melbourne shortly after, arriving on 23 September 1939 and was converted for war service by the addition of minesweeping equipment. In addition, two 20 mm guns, one Vickers .303 machine gun and a 12 pounder gun were installed along with four depth charge launchers. On 6 October 1939 she was commissioned as HMAS Olive Cam, FY76. During the War she had the nickname "Little Ol". On 21 October 1939 the new RAN ship left Melbourne and sailed to Fremantle in Western Australia, arriving 3 November 1939. She was attached to Minesweeping Group 56 and remained in service in the Western Australian area till September 1945. On 5 May 1940, William (Bill) H, Butterworth, Stoker F2919 RAN Reserve, died when he drowned at Albany WA. He was serving on HMAS Olive Cam and on the way back from shore leave (drinking with his crew mates), he slipped as he crossed the gangplank and fell into the water. He drowned. He was buried in a war grave at Fremantle with full military honours. On 29 June 1943, the ship was purchased by the RAN (along with five other Cam ships). In November 1941, HMAS Olive Cam was involved in the unsuccessful search for survivors of HMAS Sydney, sunk by the German raider Kormoran which in turn was also sunk by the Sydney. During the war Olive Cam had 20 crew and carried 200 tons of coal permitting her to stay at sea for 25 days at 8 knots. After the end of the War, HMAS Olive Cam sailed for Sydney, leaving Fremantle on 19 September 1945 and arriving in Sydney on 17 October 1945. She was placed in reserve on 14 November 1945 and on 24 April 1946, the Olive Cam was sold back to Cam and Sons Ltd for £3,000. On 11 August 11 1947, Charles Cam died aged 66. Son Rocco took over the management of Cam and Sons Limited. Once again the Olive Cam returned to her pre-War work, trawling the NSW coastline. By 1950, Cam and Sons only had six vessels in service. Increased costs, both labour and caused by the age of the vessels and increased industrial action was to lead to the company's demise. On the first Tuesday in November 1954, Australia's greatest sporting event the Melbourne Cup horse race was held as usual at Flemington Racecourse. The winner this year was Rising Fast, one of the most famous of the more than hundred winners. Two days later, the twin .45 Colt revolvers of Hopalong Cassidy were seized as they were coming through Customs at Sydney's Kingsford Smith Airport (Cassidy himself was arriving in a few days). The same day as the Melbourne Cup, 2 November 1954 (other sources say 1950 and 1955 but these are incorrect), the Olive Cam was fishing the stretch of coast between Eden and Green Cape on the Far South Coast of New South Wales under the command of Captain William Glackin, 57. At 9 pm the Olive Cam was north of Green Cape. The Second Engineer, Patrick Noctor, 35, was later to tell the Sydney Morning Herald that a "...howling south-westerly had been blowing for 24 hours. The waves got bigger and the weather rougher. The skipper decided to get as close to the shore as possible and make for Eden." The Olive Cam strayed too close to the rocks and hit a bommie. Captain Glackin order that the engine be reversed but the prop was lost (more about this later). The trawler was aground just south of Mowarry Point, south of Eden. As soon as the ship hit the rocks, Captain Glackin apparently said "It is hopeless" and ordered life jackets to be donned. The crew attempted for an hour to free the ship, but without a prop, it was, indeed, hopeless. The lifeboat was launched but it was bashed against the ship and then pushed away from the crew. The lifeboat was then smashed to pieces on the rock platform. The sea was already starting to smash the ship apart. A decision was made to abandon ship. A line was taken ashore by two or three crew members and the crew started to transfer to the land. All the while, the radio operator, A.J. Pearson, 35, continued to send SOS by morse code. After nine had made it safely, the remaining crew, Captain Glackin, Patrick Noctor, A.J. Pearson and the Second Mate, Leslie Wood, 35, started to drag themselves along the line. Mr Noctor may have been already ashore, holing the line. Mr Noctor reported that a huge wave hit the line and then a series of other waves hit them again. Captain Glackin disappeared and then Messrs Pearson and Wood were washed away. The time was now just after 10 pm. Mr Pearson's body was later found three miles to the south. The 10 crew decided to walk to Eden but after only a short distance, they tired. Mr Noctor and Neville Stanley, 35, the Fireman, went on alone and they reached Edrom guest house (which is still there on the southern side of Twofold Bay, near the now site of the chip mill). They were given food and warm drinks and then sent to bed. The others were picked up by a rescue party, perhaps dispatched in response to the SOS or maybe sent by the Edrom owners. 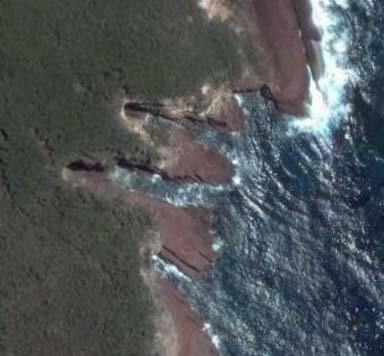 A launch took the other eight men to Eden and two were reported to have been taken to Pambula Hospital, north of Eden. Cam and Sons closed its doors and sold its ships during 1955 and 1956. The company itself was wound up in 1961, perhaps the result of court action as there is another case in 1960 that is oft quoted. Today the wreck of the Olive Cam lies in less than nine metres, many bits in only three metres. The actual wreck site is quite easy to find. The GPS Reading for the site is approximately 37° 09' 02"S 150° 00' 24"E (using AUS66 Datum - if you use another, read my GPS Page). This will put you a few metres south of a small unnamed point and off three gullies. The main part of the wreck is in the middle gully and other parts in the southern gully. To dive here you will need millpond seas, with westerly or south/south-easterly winds preferable. After anchoring in 12 metres or so, swim towards the southern gully. As you enter it, you will see many pieces of wreckage. This includes a small section of drive shaft, copper pipe and some brass fittings. If you look carefully, you will find the remains of the rudder and one and a half cylinders of the triple expansion steam engine. Ahead there is a very large "rock". In fact, this is the boiler of the Olive Cam, turned on its end. It is very large and reaches up to within a few metres of the surface. Past the boiler there are more pieces of wreck, including a winch. Continue up the gully until no more wreckage is seen before returning along the northern side of the gully back to the open sea. From here, follow the rock wall north till you come to the next gully. Enter the gully and you will find a great deal of wreckage. This goes right up to three metres or even shallower. As you exit the gully, turn left and you will see one of the ship's anchors (a Lt Rodges). This is a very attractive shipwreck, although people not interested in shipwrecks may find it a bit boring. In my view it is a very interesting dive, capable of keeping a keen "wreckie" interested for well over an hour.